The 11th volume in this much lauded series with incisive and genre-defining stories chosen my multi-award winning editor Jonathan Strahan. The internationally-acclaimed ‘Best Science Fiction and Fantasy of the Year’ series moves into its second decade with the very best science fiction and fantasy from around the world. 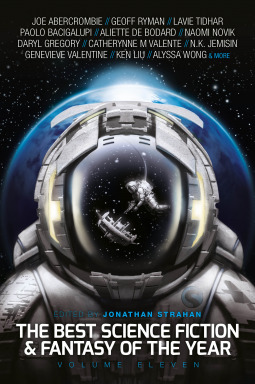 Hard science fiction, space opera, epic fantasy, dystopia, alternate history, swords and sorcery – you can find it all in the more than two dozen stories carefully chosen for this book by award-winning anthologist Jonathan Strahan to give readers a captivating and always-entertaining look at the very best the genre has to offer. *Disclaimer: I received a free copy of this story from the publisher in exchange for my honest opinion and review. A theme I love in science fiction is trying to define “what is real” when it comes to A.I. – and this is the exact problem that Paolo takes up in his short story, Mika Model… in a very unique way. A girl walks into Detective Rivera’s place station claiming that she needs a lawyer, but he feels like he knows her from somewhere… When she gives her first thought, that it when he remembers how he recognizes her: she is a Mika Model; a pleasure-bot. What could she possibly need a lawyer for? Inside of the shopping bag she has brought with her, is her owner’s head. A Mika Model is some glorified adult toy that can walk around and talk. The only difference between us and them is that we have a brain and they have CPU – which many may argue is not different at all. Setting that point aside for now, what makes these bots so special is that outside of the lack of a physical brain, they are 100% like us. They breath, they bleed, they have nerves and feel pain, and they learn. And this learning is what makes these bots feel so real. A pleasure-bot has an obvious purpose, but since these bots can learn, they become customized and adaptive to their owner personal presence. They figure out when to wink, to flip their hair; how to talk; to act strong or helpless. They able to micro analyze their owners breathing, heart rate, eye moments – all these subtle moments and changes that we as humans cannot pick up. Mika is robot, that is clear, but the question is how does Detective Rivera charge the case? This isn’t technically a murder because she it is a robot, so does that mean then that this is just a faulty product? Akin to a microwave shorting out and burning down a hose? Logic says that she is a robot and thus the company is at fault… but they way she talks (manipulates?) Detective Rivera, he begins have problems telling is she is real or not? Does she actually have feeling, is a questions he cannot answer. That question is one that each reader will have to decide: what is the difference between a brain and a computer? I won’t get into that argument here, but do we actually have feelings and choices? Or is it just our brain running its own algorithms and telling what to do and feel?